Extended Limited Warranty (ELW) Extended 6 Years After Original Warranty Expires? I am new to the forum. Ive been reading lots of helpful tips! 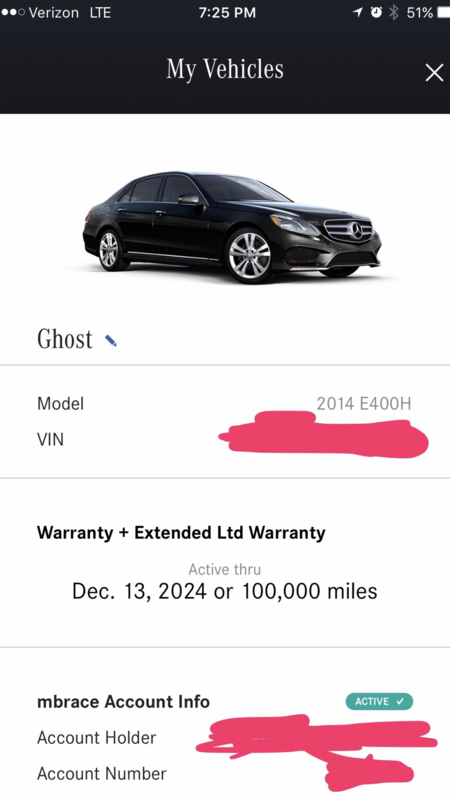 I recently bought an ELW for my 2014 E400H and when I go to mobile me I see that the warranty has been extended 6 years after the warranty expires! I bought a 2 year plan and it was supposed to end on March 2021 but it says December 2024! If this a normal error that later gets fixed? Have anyone experienced this? I've never seen that before but that is awesome to have the long of an extended period even if it gets corrected. Hopefully it covers almost everything. I've heard of some ELW covering a minimal amount of items. Good luck. I read it was really comprehensive, so hopefully I can take advantage of it. I assume that the dates might reset the last day of the original warranty but well see. I think it's a bug in their system. When I first bought my extended warranty, it showed online as expiring in 2030 or 75k miles. I had bought a 3 year 75k mile warranty to extend the factory 4 year 50k so should have 7 year 75k. this was in 2013. So it would've been good till 2020 or 75k miles. First year their system showed it was good till 2030 or 75k miles. Then the 2nd year they fixed it in their system, now it shows correct as 2020 or 75k. All the bugs usually correct themselves when it's time to pay . . I'M ALSO SEARCHING FOR A GOOD EXTENDED WARRANTY. CAN YOU SUGGEST ONE TO ME? makes sense . Thanks for the data point. I think the mercedes benz ELW should be the most hassle free since you can take it to any mb service and no deductibles. Yup! I am prepared to see the rep's face when he/she sees it and tells me it was a bug lol. USAA has the best. Exclusionary warranty for our cars. This is just experience. Will a mercedes dealer honor the USAA warranty? 100% I have had all my work done at the Local Mercedes dealer.. the only catch is you have to be a service member or former service member or have a parent that is a former service member to Join USAA..
You dont really have to be a former service member... I just lied. I said that my Great Great Grand father was in the navy and they let me join. Does anyone knows are electrical systems like Distronic Plus, Steering Assist, HUD, and massage seats covered under the ELW? Is this policy with USAA or Assurance? If you mean MB ELW, then yes they should be covered. The warranty terms should list the excluded items like trim, batteries, glass, etc. It's limited to 4/50, so if you want 7/100 need ELW. As of 1 Oct, USAA no longer offers ELW. USAA has gone shyster. I left them last year after being a 18 year customer. Just another publicly traded owned insurance company. They they just make money from the hard working people that served our country. They play claim games just as bad or worse than other insurance carriers. I knew someone who loved to use them. They use to have the lowest price on lots of things and no one could touch them. Now when he just got quotes recently they were much higher than everyone else. Interior rattles, noises and/or creaking sounds?